If you’ve ever wanted to know how to prepare for flooding, then you’ve come to the right place. Whether the result of a hurricane, torrential rain, a failure of civil infrastructure, or a tsunami event, knowing how to prepare for serious flooding ahead of time can drastically reduce the adverse effects on both you and your home. Severe flooding can be unexpected, sudden, and devastating in equal measure when it strikes, making it a preparedness priority if you live in an area at risk of being affected by flood events or rapid catastrophic rises in water levels. Knowing how to prepare for flooding means having a full understanding of the main causes of floods, the risk factors, and the consequences if a sudden rise in water levels takes place. Armed with this knowledge, you can begin to plan and put a preventative strategy in place, equip yourself with the essential supplies for such an event, and assemble an emergency response plan to get you and your family out of harm’s way if major flooding seems imminent. 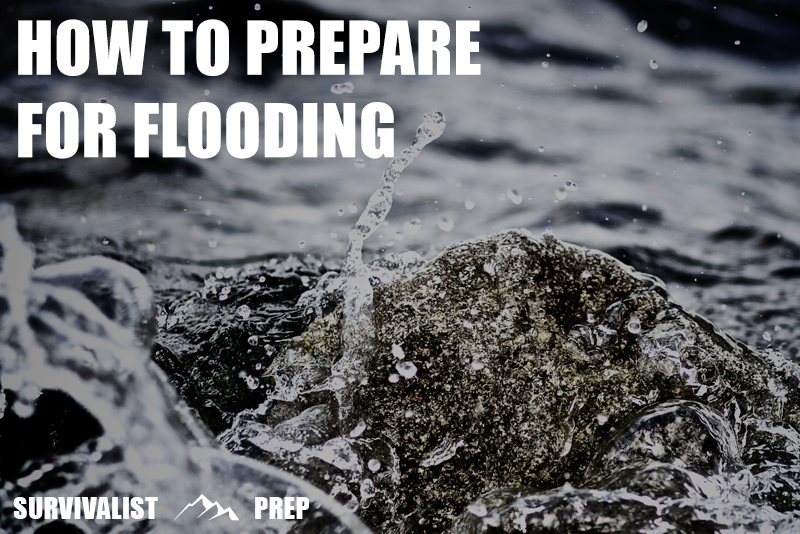 By the end of this guide, you’ll be equipped with the fundamental information to help you prepare for flooding and can begin implementing the steps to make sure you’re fully protected before the water rises. At the most basic level, the term ‘flooding’ refers to the temporary covering of usually dry land with water due to an overflow from drainage channels or from a body of water or source such as the ocean, rivers, lakes, and reservoirs. The levels of this excess water can vary greatly during a flood situation, ranging anywhere from a couple of inches when street drainage backs up, to several feet following a major event such as a severe storm, tsunami or river overflow. While some floods occur over a prolonged period of days, others can come seemingly out of the blue in the form of flash floods. This latter type of flood can be particularly devastating as little to no warning may be given of the onset of such an event. Flooding can take place as the result of a wide variety of causes ranging from natural disasters and extreme weather events, through to catastrophic failures in civil infrastructure from either accidental or intentional incidents. Severe tropical storms and hurricanes represent one of the most obvious flooding threats and whether we’re talking about recent major storms like Harvey, Sandy, or Katrina it’s not hard to see why. From unrelenting torrential rain and overflowing rivers, to coastal surges and broken levees, tropical storm systems and hurricanes can introduce untold flooding misery in the areas where they make landfall. When coupled with the effects on infrastructure caused by high winds, flooding in these situations is likely to be exacerbated by large scale power outages and a general lack of services and access. Many areas are ultimately open to some degree of flooding risk of a certain extent, but those living in areas close to bodies of water such as rivers or lakes as well as those near coastal areas are always going to be more susceptible to serious floods than those further inland. As covered earlier, one of the major threats of serious flooding comes in the form of a hurricane or severe storm unfolding. With this in mind, those in the potential path of a serious storm are also inherently going to be at increased risk from potential flooding. With these factors in mind, an assessment of your current geographical situation is crucial to gaining an accurate understanding of flood risk where you live. How far am I from the nearest river, coastline, large lake, reservoir, or other water systems? Do I live on low-lying land such as a valley or floodplain? Does my area have a history or potential for hurricanes, cyclones, typhoons or other tropical storm activity? This top level overview is a great starting out point for assessing the potential for flooding where you live. The next step should be to consult any official flood risk maps provided by either local or national government if available. In the US, the USGS Current Floods Map is a useful resource for this. In the UK, the Long Term Flood Risk Assessment tool is excellent for knowing the risk to your area as well as providing maps. Of course, even if these assessments don’t show high risks of flooding in your immediate home area, you should always look to build in a level of resilience and preparedness and when it comes to any natural or man made disaster, expect the unexpected. In a lot of ways, preparing your home, your family, and your equipment/supplies for any disaster or major emergency situation can be thought of as building your ‘survival ark’ in the case that disaster strikes. While maybe not a physical object as in the ancient story, this metaphor works well here with your survival strategy and equipment effectively serving the same purpose in an emergency situation – providing you with the fundamental framework for survival and continuity when a disaster is imminent or underway. The key point here of course, is that preparing for the worst ahead of time (skill acquisition, emergency planning, buying supplies and equipment) while keeping a close eye on global events, climate changes, and geopolitical trends will make all the difference when an emergency situation begins to unfold, allowing you to react fast while others hesitate. Those who are prepared, survive. Depending on the specifics of your individual situation, this preparation may look like preparing an evacuation strategy and building a fully stocked bug out vehicle that can be called upon the moment things look like they’ll turn bad and heading for safety. For others, their ‘ark’ may take the form of a totally resilient home preparedness plan, reinforcing any weaknesses or liabilities in the structure itself and building a stockpile of food and critical home survival supplies and redundancies to weather the storm. Whatever approach you take, preparation in advance is absolutely critical to the success of your eventual survival strategy and minimizing the risk to you and yours, and when it comes to emergency preparedness, having something together is always better than having nothing. Whether you’re preparing for a natural disaster like flooding or an earthquake, or a man made event like a nuclear attack or economic collapse, the same rules will always apply. Check your Policy – Does your current home insurance policy cover flooding and if so, what level of cover will you receive in the event of a major flood event? Is it sufficient or does it need revisiting while the ground is still dry? Remember, it’s no good trying to buy an umbrella once it’s started raining. Know Local Evacuation Plans – If your state or local government have evacuation plans and designated centers in place for flooding situations, it’s worth knowing about them ahead of time (even if you don’t intend to use them) when the time comes. Carry out a Home Audit – How resilient is your home to flooding currently? If a flood were to occur next week, what can you identify as being the most ‘at risk’ items. If you have a fully carpeted home and live in an area vulnerable to flooding, now’s the time to think about considering alternative flooring that wouldn’t be destroyed by water. Prepare a Household Flood Plan – Up front planning now avoids the need to make difficult decisions under duress during an emergency situation. Begin thinking about your first, second and third choice flood reaction plans and ensure that everybody in your household knows how to respond if a flood is coming. It’s imperative to build as many levels of redundancy into your strategy as possible to ensure that if your best-laid plans go awry, you’ll still have multiple fall back options without having to think about it. Build Emergency Kits – We’ll cover this in depth later, but it’s important to emphasize the importance of building up a stockpile of supplies for every eventuality. You will need to have kits and supplies for your home as well as portable supplies and gear to last you at least three days in the form of a fully stocked bug out bag should you choose or need to evacuate your home. As with all of our preparedness guides, we reference as many expert sources, real world user reviews, and opinions as possible so we’re able to provide the most relevant and educational information on the ins and outs of how to prepare for a flooding event. Knowing how to prepare for flooding is ultimately a highly personal activity with individual needs and preferences sometimes varying considerably between people, locations, and specific situations. With these considerations in mind, this guide looks to provide advice on our own opinions of how to prepare for a flood, however, it’s always important to carry out your own due diligence to find the best solution for you when developing a strategy, plan, and solution that’s perfect for your situation.